David Cortright teaches peace studies at the University of Notre Dame and is the author of Peace: A History of Movements and Ideas (Cambridge). 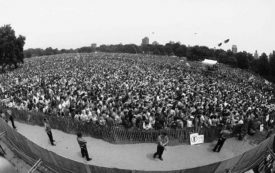 In the 1980s, millions of antinuclear activists took to the streets, forcing Western governments to respond to our demands. We can do the same now. Regardless of who started the war in Afghanistan, it is now Obama's war. Preventing military escalation is necessary if the president doesn't want it to become his Vietnam. The humanitarian crisis is further evidence of the abysmal failure of US policy. Under cover of darkness in the early morning hours of March 18, Qusay Saddam Hussein carted off nearly $1 billion in hard currency from Iraq's central bank. As the Bush Administration continues its illegal and unjust military invasion of Iraq, we must steel ourselves for the difficult days that lie ahead. The movement can seize the moral high ground and win support for change. Death rates are alarming but lower than claimed. Saddam shares responsibility.